December: The month of holiday festivities, gift shopping, decking the halls, and this year... awesome celestial events. While you're running around finishing up those last minute holiday errands, don't forget to look up, because the times of the supermoon and meteor shower in December of 2016 are pretty much simultaneous! I know you might still be reeling from the mega supermoon that electrified the night in mid-November, but a mere month later, the sky is going to put on a show all over again, whether we're ready for it or not. It seems like an embarrassment of riches to have the last supermoon of the year align so perfectly with the dazzling annual Geminid meteor shower — and we should thank our lucky stars, because this doesn't happen very often. According to EarthSky, December's full supermoon will shine its brightest on Dec. 14, while the Geminid meteor shower is set to reach the climax of its peak the evening of Dec. 13 (early morning of Dec. 14). Moonrise varies depending on where you are, but the supermoon will rise in some places as early as 4:41 p.m. EST on Dec. 13, and at 5:40 p.m. EST on Dec. 14. (To find out what the exact time of moonrise for your city, check out Time and Date's moonrise calculator.) Many found the November supermoon to be at its largest and brightest while rising, so be sure to keep your eyes on the sky during these times in December. But while the supermoon will be more striking earlier in the night, the meteors of the Geminids will grow in numbers as the Gemini constellation — the shower's radiant point — rises in the sky. This means that the early evening will actually not see much action, meteor-wise. Instead, grab a coffee and head outside around 2 a.m., regardless of your time zone, when the constellation reaches its highest point in the sky. 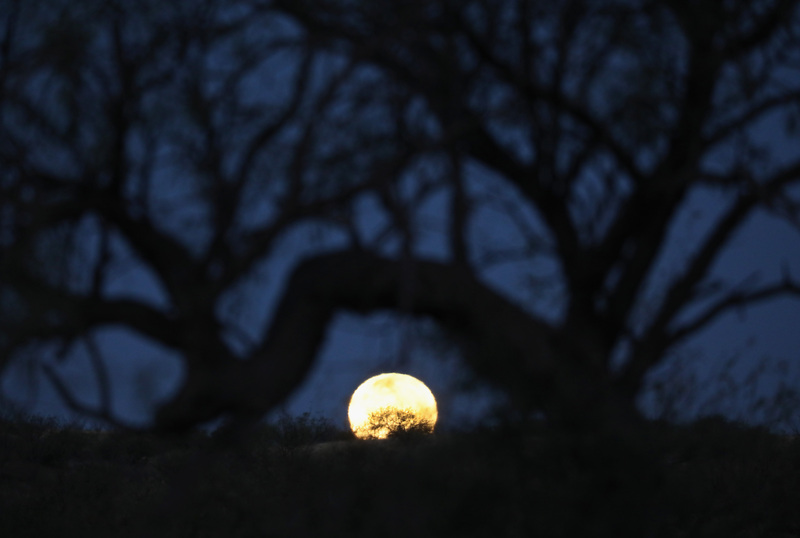 The supermoon will still be plenty visible at 2 a.m. when the meteor shower peaks against the dark sky. The one downside of this simultaneous event? The glare from the supermoon will reduce visibility of the meteors during their peak days of Dec. 13 through Dec. 15. But do not be disheartened! The plucky Geminids are known for their brightness, and despite competing with a full moon that is as much as 30 percent brighter and 14 percent larger than average (hence the term "supermoon), a few will still shine through as they burn up in our atmosphere. Capturing a picture of a fireball streaking across the supermoon-lit sky will spell immediate Instagram fame, so you may want to grab your camera, like, now. This special astronomical coincidence is definitely something to add to your busy winter calendar. What could be a better way to deal with holiday stress than by grabbing a friend and some peppermint hot cocoa and spending a few hours stargazing?